I’ve really loved Apple’s Screen Time feature. It’s got me paying more attention to what I’m doing and being a little more intentional with the way I use some of the different apps I’ve come to rely on. One thing it’s taught me is that I spend way too much time on Quora. 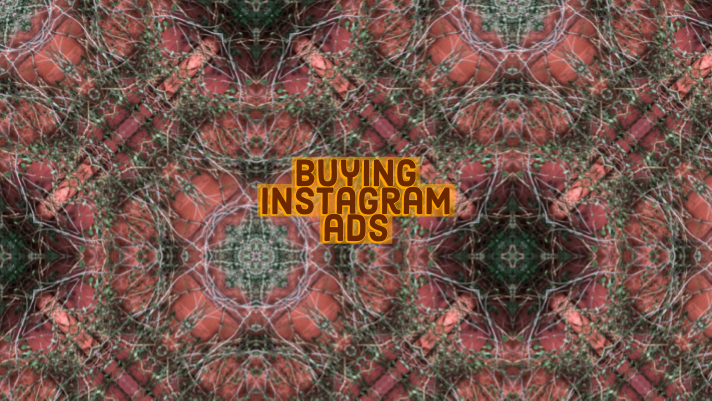 I wrote up an answer to a question earlier today about buying Instagram ads that didn’t target your followers and it got me thinking about something I’ve noticed a lot over the course of the last year. A lot of really smart people still buy Instagram ads directly through the Facebook business manager. I realized that I hadn’t done that in a really long time, and that I hadn’t seen a ton of great posts about how you can avoid doing that. There are a few situations where you might want to do this. I can think of two. The first is that you’re trying to grow a presence on Instagram, not just extract value from the ads manager. In that case, you might want to expand the types of people who are following you. If you want to take the posts that you already have, and make them more popular, you should be doing it this way. The second is that if you’re trying to drive traffic through a funnel (and already have something like dynamic advertising set up) you might find that this approach allows you to better identify traffic from any one given audience source. Before we get started, it’s important to make sure a few things are true. you need to be using an instagram business account on your phone. that insta business account needs to be connected to a business facebook page. that business facebook page needs to be connected to an advertising account that has been used at least once with the instagram account placement. First, you’ll need to create a post object by creating a post. While you can do this programmatically or via the Ads Manager interface, I think it’s best to do it natively on the platform. You’re probably pretty familiar with that, but if not, just grab your phone, open the app, hit new post, find a photo or take a picture and post to instagram! For the purposes of this answer, I’m using a photo I have from a walk I took this morning. It’s not great but it’ll get the job done! Select your photo to expand it, and tap the blue “Promote” button. You’ll be taken to a page where you are presented with three options you can select from to promote your post. Here you can select your outcome. If you’re used to advertising on Facebook, I think these three campaign types are pretty similar to “Likes” “Clicks” and “Reach” campaigns from Facebook. They aren’t exactly the same, and we’re going to make some changes later on, but it’s a reasonable way of approaching them. I almost always select profile views. I do this because content people like to engage with is more likely to generate engagement from people who _interact_ with the people who are _like_ the ones I am targeting. It’s not a “given” that the people who you _can_ reach with your advertising are the people who are going to buy your product. The people who are active on these platforms spread the information they collect to people who are less active. I like to think of this as being very similar to the way that we often get recommendations for books and movies and the like from the people who we are around. You can spend a lot of time exploring this idea, and a few people have. It’s worth getting into if you’re interested but more than I can post about here. Whatever your objective, make sure you’ve taken the time to understand how it will contribute to the business objective you are trying to accomplish by advertising in the first place! When you’ve selected your campaign, you’ll be asked to choose your target. I guess I can understand why the default might be to target people like your followers, it really does make sense if you’ve spent a lot of time building out a good sample of people for the platform to model a lookalike audience from. I think the trouble is, a lot of people just don’t have followers like that. I know that my first 100 followers or so on my business account were all friends and acquaintances of mine from different stages of my life up until the point I had started my new venture. While it was nice that many of those people were supportive, they weren’t really representative of who my customers might be and who I was trying to help! In some cases, “Local” might work out OK for you! Facebook has a ton of great location data to work with, so you can feel reasonably confident in the people it will target. If you just need to reach people in the area, this is a handy enough feature. It’s a good way to start to experiment with the tool. However, to really get the most out of your campaign, it’s best to build your own target and then, once it’s approved, edit it in the business manager. I’ve noticed this tool is a little unstable. You can pick about three locations. You can edit in a lot more than that later. You can pick about four interests. You can edit pretty much everything else about that later. If you’re working with a brand or a business, you’ll likely have an age, demographic and location target in mind already. If you’re experimenting or trying to learn more, you’ll want to find places to advertise where you don’t break your budget. Facebook prices media differently in different places, so you may be able to find some savings as you explore the globe. In different parts of the world, people use the internet in slightly different ways. You should expect to encounter all sorts of things. But, I suppose that’s true of many ad campaigns. Once you’ve made your initial selections, tap to move to the budget screen. Once you’ve made your selection, you tap forward once more to view the confirm payment screen. Now, close instagram and wait for awhile. Before too long, you’ll get a notification that your ad was approved. That’s great, now you’re ready to switch to facebook! Navigate to Facebook Business Manager (business.facebook.com) and look for the ad account linked to your instagram account. Once you find it, click and open it in a new window. you won’t be able to edit _everything_ about this post from business manager. If you edit too much, it seems to get unhappy. However, I’ve noticed that it really doesn’t mind subtle changes to placements and that sort of thing. My hunch is that since you’re using saved audiences inside of the Instagram promotion tool, it doesn’t mind it if the audience definition updates, it just quietly updates right alongside it. Here’s the edit view from one of my recent posts. That’s an OK sized audience, but I bet we can get more out of it. Let’s start by editing some of the countries we targeted. You can’t actually exclude instagram followers from business manager, but you can exclude people who are connected to your facebook page, which might be the same thing. To do that, scroll down and take a look at the connections section. Once you’ve made your changes, select update to save. Facebook should tell you that your changes have been made and that the updated audience will be applied to your adset. Now, I’m going to fiddle with a few more things. First, I’m creating an ad for a post I’ve already advertised, so I’ll need to update the budget and date setting. Easy enough, ooo, let’s check out this Instagram story placement! Maybe it’s the instagram story placement. Turn that off, and…. Over the course of how ever long you set this thing up to run for, it’ll do what you asked with the updated audience. You can also recycle that updated audience in the future from the phone directly with new posts. I’ve been doing it this way, since December or so…so I figured that was as good a sign as any it was time to share. As I’ve experimented, I’ve noticed that’s really helpful if you post a lot of one type of content. (In my case, it was flower photos :| ) as you build a relationship with that particular audience segment, you’ll find that you can get better results with each passing attempt. I suspect that because this really only lets you edit the date and the audience, it’s not really something you can go too wild with, but it does make instagram ads a lot more powerful because it makes it easy to promote a post while preserving its social proof, and for some teams, that can be a big deal.